Solving for market equilibrium with individual consumers and firms - FreeEconHelp.com, Learning Economics... Solved! Suppose that our market consists of three consumers (say consumer 1, 2, and 3) with the individual demand curves q1 = 5 – p, q2 = 10 – 2p, and q3 = 7 - .5p respectively. Suppose that there are 4 identical firms with the marginal cost curves MC(q) = 1 + .25q. Assume no other firms can enter the industry so that we are in the short run in this sense. a.) 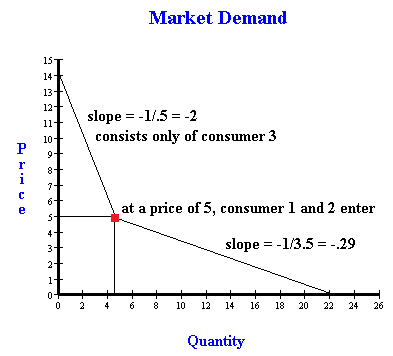 Find the equation for and plot the market demand curve. This means simply summing q1 + q2 + q2. This sum is the total demand by all 3 members in our market at price p. b.) 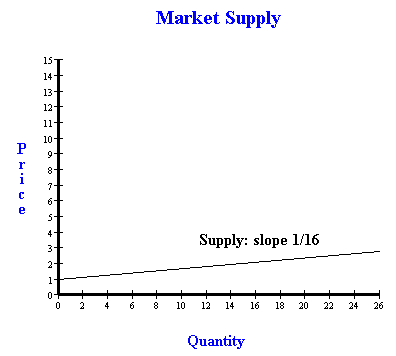 Find the equation for and plot the short run market supply curve for a competitive industry with the above 4 firms. This means we must first solve for q in the MC equation and then sum the q’s across firms. All 4 firms are the same so you just multiply q by 4.
c.) Solve for the short run competitive equilibrium output and price. Diagram the equilibrium and label your diagram. 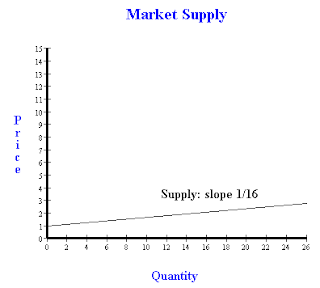 To get our market supply equation, we need to again add up the quantity supplied by each individual firm. To do this you must rearrange the equations and solve for q (quantity). 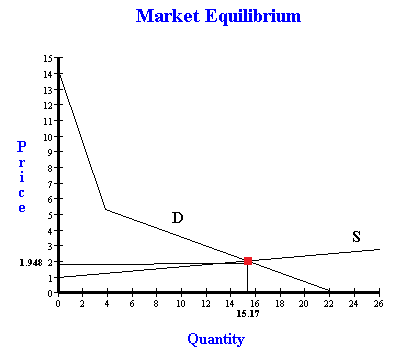 Then you can add together each of the individual quantity’s supplied to get market quantity. The intuition behind this step is that in a perfectly competitive market, marginal cost (MC) is going to equal price (p) in equilibrium). So when we rearrange the supply functions, we can think of the firm as saying: “I am willing to supply this much if the price is this…” which is valid because the firm is trying to cover their cost. MC = 1 +.25q, which means that MC starts at 1, and goes up by .25 as more quantity is produced. q = 4p – 4, which shows us that the price has to be higher than 1 for any quantity to be produced. This makes sense because the minimum marginal cost is 1. Also, if p is 2 then q will be 4. If we plug a q of 4 into our first equation we get a MC of 2, so we know we did it right.